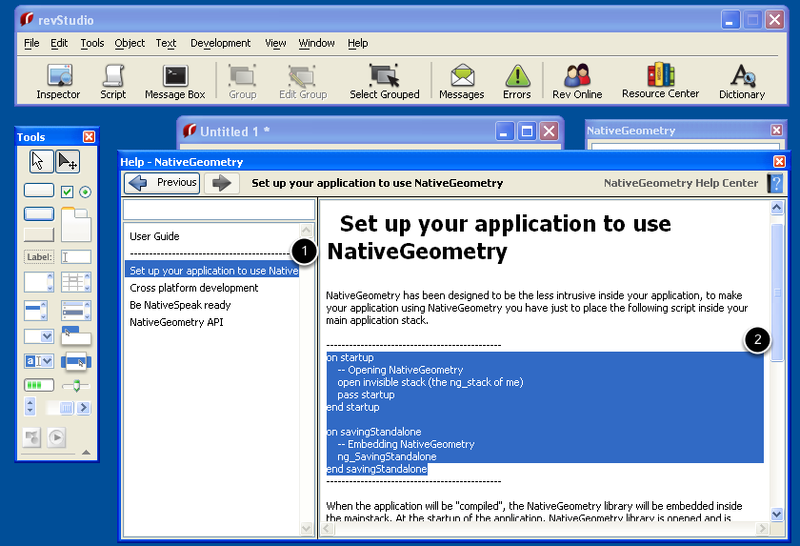 NativeGeometry is a complex technology, its core contains thousands of lines just to do one simple thing: The entire geometry management of your application. This tutorial will show you how to get started with NativeGeometry. 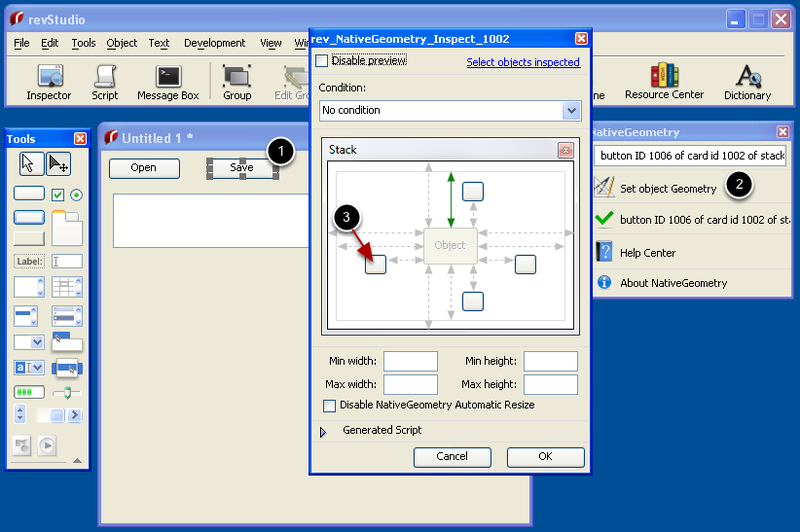 After completing this tutorial you will be able to do basic operations with NativeGeometry. The implementation of NativeGeometry is straightforward. First, create an empty stack (1), then open the NativeGeometry help center (2). In the help center, click "Set up your application to use NativeGeometry" (1), then copy the highlighted code snippet (2) by pressing "Ctrl+C" or "Command+C" . Finally, edit the script of the newly created stack, and simply paste the copied code snippet using "Ctrl+V" or "Command+V" to paste. 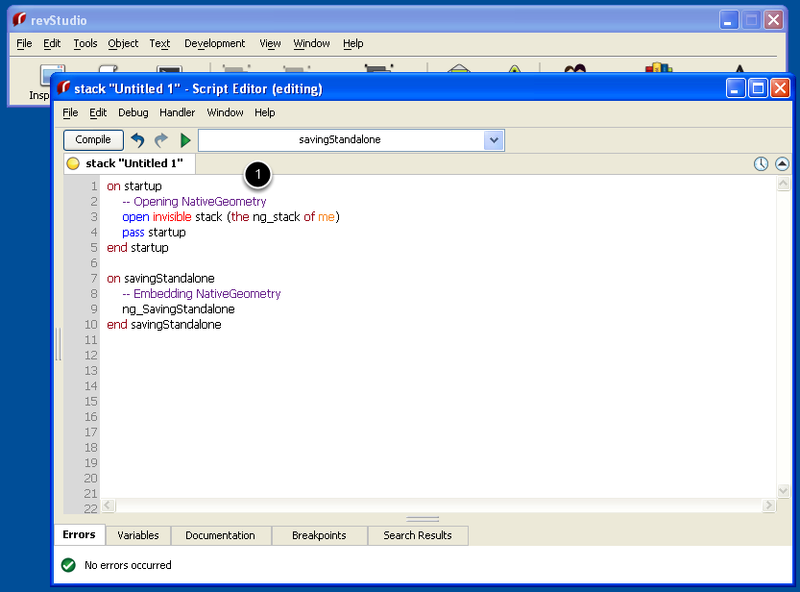 Now your application has NativeGeometry embedded and you will be able to use it. We will write a really simple application, which you can complete within the NativeGeometry trial limitations if you do not already have a license for NativeGeometry. 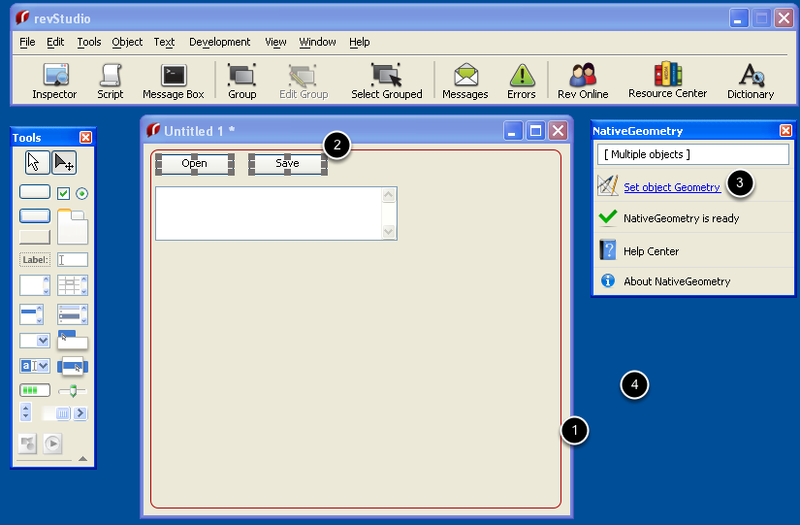 Simply place two buttons (1) and a scrolling field (2) in the newly created stack. Now, we want to have the "Open" and "Save" buttons at the top "padding" of the stack, so that they look good on all platforms. The padding is a virtual property that depends on the platforms where the applications will be launched. This property avoids objects colliding with each other and prevents you having to set fixed sizes. 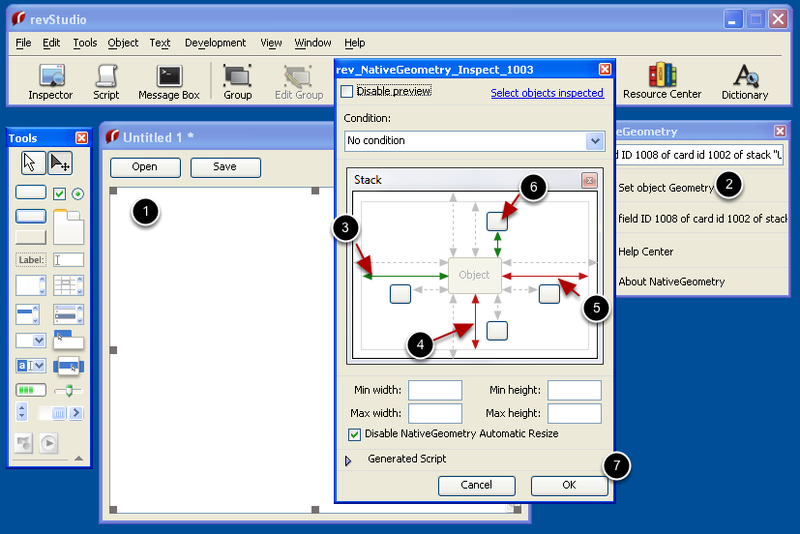 Now, select the "Open" and "Save" buttons (2), then click "Set object Geometry" (3). The NativeGeometry inspector is a complete palette that enables you to define the geometry of your application quickly and easily . 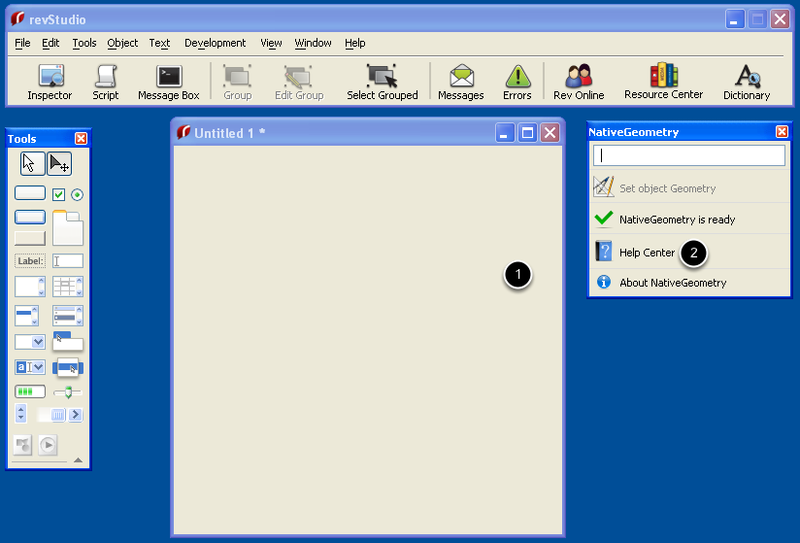 To set the "Open" and the "Save" object to the top padding of the stack, simply click "1". You will see that instantly your objects have been placed and resized! 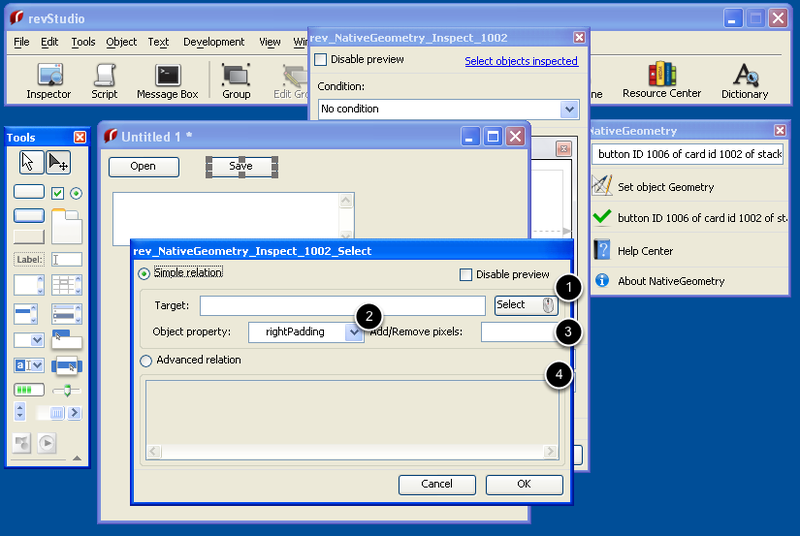 Don't worry, the NativeGeometry palette by default let's you preview all your modifications, if you click "Cancel" your objects will have their original size and positions restored. To disable the preview option, click "Disable preview" (2). Also you will notice that your objects have been resized, this is normal; NativeGeometry automatically adapts the objects' sizes depending on their content and the platform. 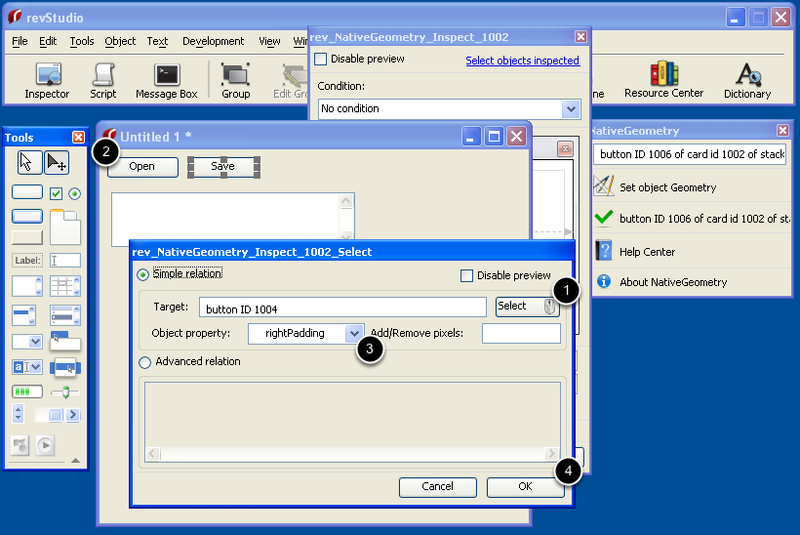 You can turn off this option using "Disable NativeGeometry Automatic Resize" (3). If you want to have an application localizable that looks good on all platforms, do not activate "Disable NativeGeometry Automatic Resize" (3), unless you do not want to have NativeGeometry resizing some objects. To apply the new geometry, click "OK" (4). 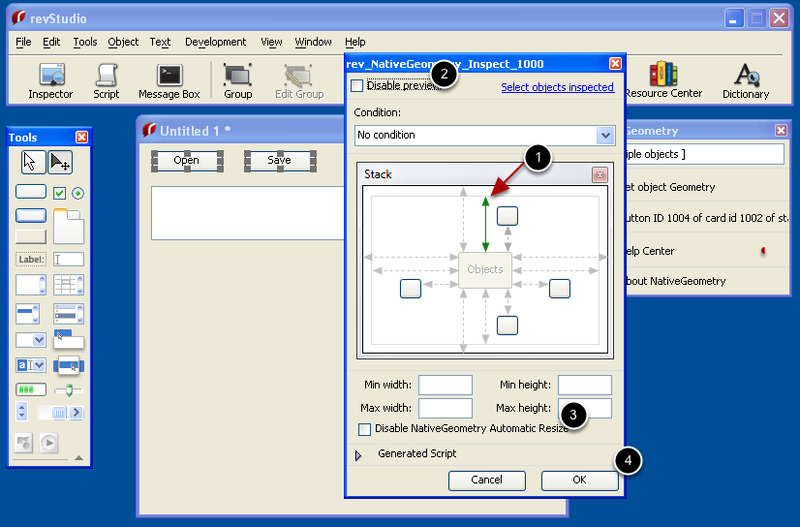 Select the "Open" button (1), click "Set object Geometry" (2) then set its left to the left padding of the stack (3). That's all, the "Open" button is now strictly placed. We want to have the left of the "Save" button to be at the right of the "Open" button, with a space between them. So, select the "Save" button (1), then click "Set object Geometry" (2), then click the button (3). - Or write directly an advanced geometry relation, for example, 'the height of this stack / 2 + the left of button "toto" + 6'. This will be covered in another tutorial. Click "Select" (1) then click the button "Open" (2), check the property read (3), finally click "OK" to close this window and click "OK" also in the NativeGeometry inspector. 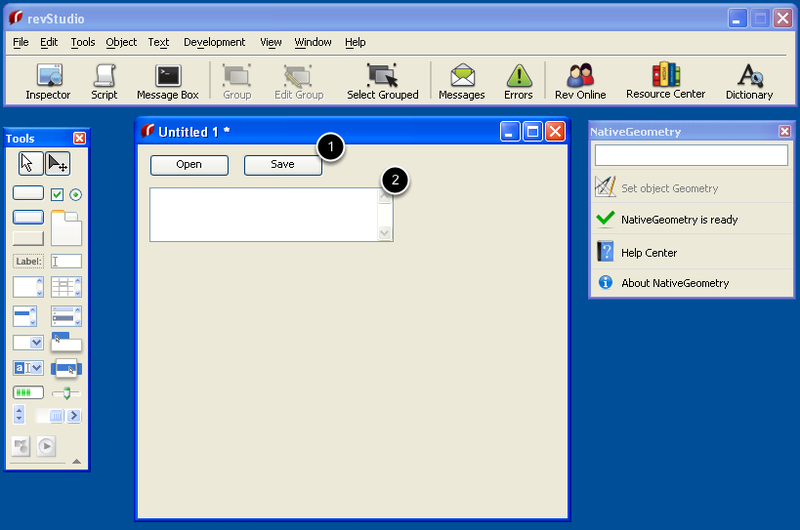 Now, you have the "Open" and the "Save" buttons that have their geometry correctly defined. Let's set the geometry of the field now. Now that you know how the property inspector works, it should be a straightforward quick task. - Click (6) and select the button "Open"
- Click "Ok" (7) to apply the new geometry. That's all, the field is now resized! 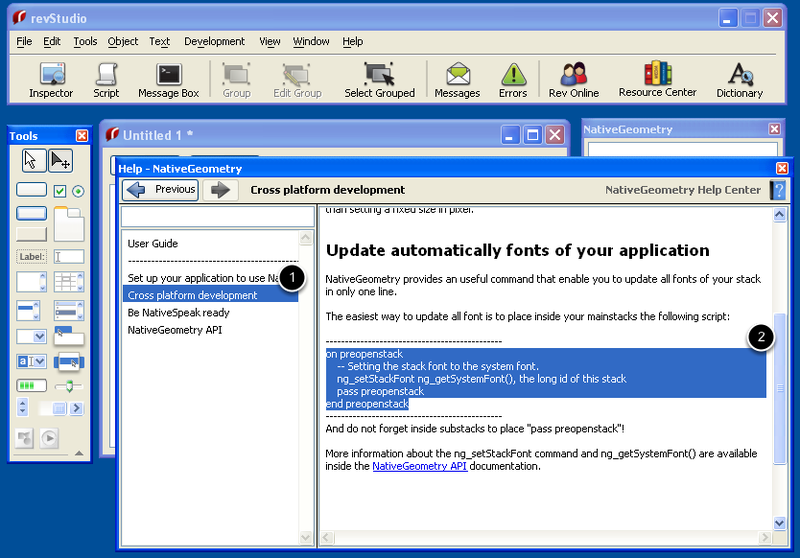 In order to have a perfect application, NativeGeometry enables you to automatically set the font of your application. To enable that feature, open the NativeGeometry help center, then click "Cross platform development" (1), then copy the highlighted code snippet (2) and paste it inside your main application stack. ("Untitled 1" in this tutorial). Now, no matter what the platform, your application will always have a good font, and objects will be good looking. Save the stack, configure the standalone builder then simply build your application and launch it. This is the end of the first NativeGeometry tutorial, it showed you how to use the NativeGeometry inspector in order to make quickly a good looking GUI with NativeGeometry. The next tutorial will be focused on the NativeGeometry API. Prev: What Are The Available DGH Properties For Custom Headers? I have two draggable objects. I want both the objects to move as I drag them but I don't want them to collide or get overlap. Also how is it possible to drag them inside another object limiting their path...? For eg, I want to Drag two square inside a Circle but I don't want both the square to collide or to overlap. Also the path of the squares should be limited inside the circle. 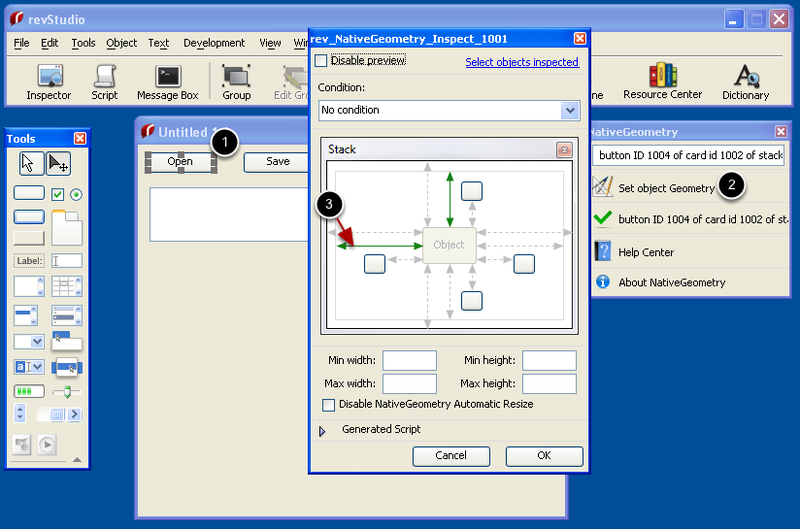 the Geometry Manager is used to position the controls in your application. You would not use it to test for intersections. You will have to do a bit of manual work to implement the kind of behaviour you are after, but there are some pretty useful functions that will help you. You can use the "mouseMove" event handler to catch any mouse movement events from the user and then use the "intersect" function to find out if items that are being moved intersect. Have a look at the dictionary for more information on the relevant LiveCode syntax.